It’s their favorite night of the year! Oct. 31 means trick or treating, of course. One thing parents need to be aware of, especially parents who are new to a community or new to having kids trick-or-treating, is that most area towns have specific trick-or-treat hours. And in many communities, they only get two “official” hours to trick or treat in the Champaign-Urbana metro area. Use our guide to make the most of this very special day, and be sure to check back as we add in more confirmed area trick or treat times! 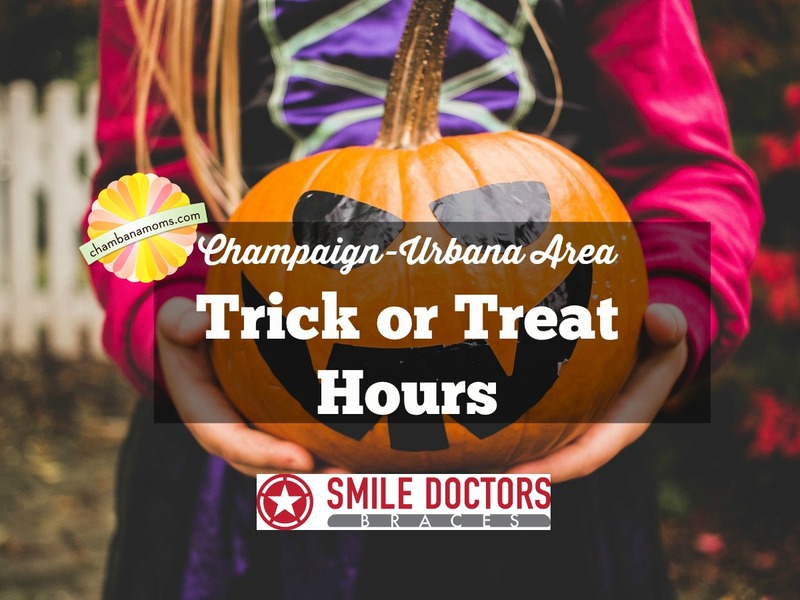 For your planning convenience, here is a list of Champaign-Urbana metro area municipalities and their trick-or-treat hours for Halloween. So put on your costumes and bring a sack, it’s time for trick or treat! If you’re looking for an alternative to traditional trick-or-treating, there are several options listed in our Halloween Fun Guide. Prefer to go trunk to trunk over door to door? Check out our Area Trunk or Treats Guide. Looking for something a little more spooky, check out our Fright Guide for teens and adults. Need some budget inspiration for that last minute costume? See our post on Top 7 Ways to Save Money on Halloween Costumes in Champaign-Urbana. Champaign: 6 to 8 p.m.
Homer: 6 to 8 p.m.
LeRoy: 5:30 to 8 p.m.
Mahomet: 6 to 8 p.m.
Monticello: 5 to 8 p.m.
Paxton: 5 to 8 p.m.
Pesotum: 5:30 p.m. to 7:30 p.m.
Philo 6 to 8 p.m.
Savoy: 6 to 8 p.m.
Sidney: 5 to 8 p.m.
St. Joseph: 5:30 to 8 p.m.
Urbana: 6 to 8 p.m.
Tolono: 6 to 8 p.m.
Rantoul: 6 to 8 p.m.
Villa Grove: 5 to 7 p.m. If your town isn’t on this list (and we know there are many that aren’t), let us know your confirmed trick or treat times in the comments below and we’ll be sure to add them!